This year’s Money2020 and CoinAgenda conference in Las Vegas including Apptrade’s ‘Stock market of apps’ – the brainchild of experienced app broker and founder Daniel Pineda. Apptrade is now partnering with the well-established cryptocurrency crowdfunding platform OpenLedger. 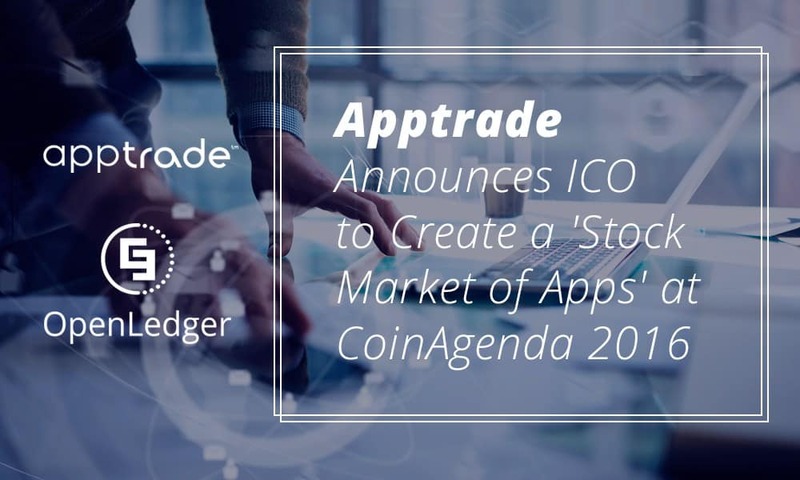 Apptrade announced a pre-sale for select profit sharing participants and public ICO with OpenLedger at Coin Agenda, during a presentation with BitAngels. Apptrade aims to create a ‘stock market of apps’, where developers can raise money with regulation compliant blockchain tokens. Investors will be able to trade these assets, backed by app revenue streams on OpenLedger. Apptrade defines apps as intangible goods. i.e. mobile apps, music, eBooks, 3d asset libraries, blogs, photos, and other digital based properties. Apptrade will offer its own token for their ICO entitling investors to 10% of the net market value and revenue of the Apptrade ecosystem. Apptrade will have a decentralized exchange on the Bitshares blockchain. Apptrade will allow app publishers to pool resources in a collective fund that works as collateral to attract funding. Each app contributes a portion of earnings to a shared digital reserve. These pooled resources are blockchain assets with standardized regulatory features, providing a way into the market for institutional investors. Finally, Apptrade is creating market analytics tools for app value analysis. Speculators will be able to easily track the monetary trajectory of portfolios alongside each app analytics through a private dashboard. The value will be distributed via digital tokens on the Apptrade market through Apptrade and OpenLedger. Investors can then buy these portfolio tokens backed by revenue aggregated from app portfolios. This digital reserve will be secured with price stable tokens called ‘smartcoins’. All these assets are fungible and can be traded on the upcoming Apptrade marketplace. Risk will be further reduced by Apptrade’s publisher due diligence and regulation compliant token structure. This default token structure is designed to build market trust and credibility over time. Apptrade will be using ready-made smart contracts with built-in compliance features to run a legitimate market for investors. Apptrade will provide another unique innovation for their partners: a gradual distribution of tokens. This will give each portfolio market a chance to get acclimatized to dynamic trading and resist the impact of unforeseen problems on the market. Additionally, Apptrade is building tools for investors to compare the performance of app portfolios on OpenLedger with the actual app market by pulling data from Apple and Google servers. This gives token buyers access to more detailed information when using Apptrade for speculation. The OpenLedger hosted Apptrade ICO will kick off in the coming months; interested investors are encouraged to speak with OpenLedger’s CEO Ronny Boesing to arrange pre-investments. Apptrade is making the ‘stock market of apps’, complete with regulatory tools and compliance mechanisms. OpenLedger is an ICO crowdfunding ecosystem striving to bridge the gap between innovative blockchain based startups and mainstream investors.